Cinnamon is one of those unmistakable herbs that triggers memories for everyone. Melt-in-the-mouth hot cross buns, cinnamon toast and biscuits, fragrant milk tart, spicy curries – there’s nothing quite like the aroma of cinnamon swirling around the kitchen at Easter, and when the weather starts to grow cooler. It’s warm and comforting, and eating it is good for you too. Derived from the bark of the Cinnamomum verum tree, cinnamon has long been a favourite of Chinese and Ayurvedic medical practitioners. It is prescribed for colds, indigestion, cramps and diarrhoea and to improve energy, vitality and circulation. Modern Western herbal practitioners recommend cinnamon to support metabolism and digestion. 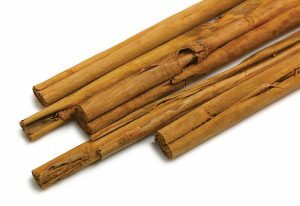 The bark of the cinnamon tree, which is removed carefully (it does grow back), rolled into a tubular ‘quill’ or ground into powder. Cinnamon is rich in polyphenols, antioxidants that help defend the body against free radical damage. The water-soluble polyphenol compound type-A polymer mimics insulin, activates its receptor and works synergistically with insulin in cells. Cinnamon also contains manganese, calcium and fibre. Cinnamon has potent antioxidant properties that may assist a normal response to glucose in healthy individuals. In a report in the US journal New Scientist, a scientist at the Department of Agriculture’s Human Nutrition Research Center discovered that half a teaspoon of cinnamon a day significantly reduces blood sugar levels in diabetics. The effect, which can be produced even by soaking a cinnamon stick your coffee, could also benefit millions of non-diabetics who have a blood sugar problem but are unaware of it. The test group also showed lowered levels of fats in their blood as well as reduced ‘bad’ cholesterol (LDL), both of which are also partly controlled by insulin. Cinnamon aids digestion, eases gastrointestinal upset, diarrhoea and gas. Improves general colon health. Cinnamon’s antioxidant properties fight damage caused by free radicals. Can help in weight loss. Ayurvedic literature shows that cinnamon has anti-microbial and anti-infection properties that hinder the growth of bacteria and fungi. May relieve headaches and migraine. An Iranian study revealed that cinnamon appears to ease menstrual cramps. May relieve symptoms of the common cold and influenza, especially when mixed in a tea with fresh ginger. This good news does not mean you should wolf down more hot cross buns or milk tart – they contain lots of fat and sugar. Instead, add cinnamon to your usual diet. Although cinnamon has no known serious side effects (heavy use can irritate the mouth and lips, causing sores), it is always wise to consult your medical practitioner before taking natural remedies, especially if you have existing health problems, are pregnant or breastfeeding, or are on medications. Use for cinnamon toast; to flavour milk (simmer cinnamon sticks in milk and add honey to taste); create a Middle Eastern mood with lamb pieces sautéed with eggplant, raisins and cinnamon sticks; sprinkle generously over milk tart; and, of course, add a stick or some ground powder to your favourite curry. Store cinnamon in a tightly sealed container in a cool, dark, dry place. A native of Sri Lanka, this member of the laurel family is a tropical evergreen tree and needs a low altitude with a moist, hot, tropical climate to thrive.